The year has been another year of growth and development of the library. The resources have increased and the services have expanded particularly electronic resources. Circulation statistics reflect an increase use by the students in borrowing books for their studies. The new library website provides detailed information concerning library operations and the services and resources provided to the academic community. Library staff members have benefited from opportunities for professional development. Visitors are invited to sign the guest book when visiting Turathuna. The list of donors continues to grow. Both individual donors and different agencies and organizations contribute to our development. The extensive electronic journals databases and the new library management system would not have been possible to add without the financial support of the agencies that provided the funds. I express my deep appreciation to all the organizations as well as to those individuals who have contributed even one book. Our growth and development is possible as a result of your consideration in contributing. Details of these developments are included in this issue. 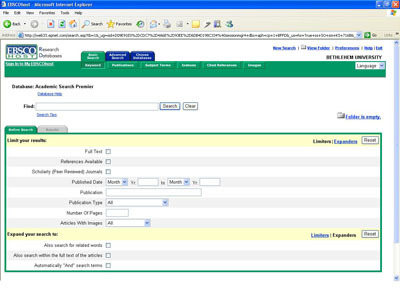 In a joint project sponsored by the Palestinian Committee of Academic Libraries (PALCAL), the Ministry of Education and Higher Education (MOEHE), the Academy for Educational Development (AED) – Higher Education Support Initiative (HESI) and funded by USAID all Palestinian university libraries have been provided with a one year subscription to EBSCO Academic Search Premier. This electronic journals database is the world’s largest scholarly, multi-discipline, full text database designed specifically for academic institutions. This resource indexes more than 8,000 publications and contains full text for more than 4,700 of those titles covering nearly all academic areas of study. A detailed description of the database and a guide for the user are available on the library website (library.bethlehem.edu). The enclosed table reflects recent usage. On her most recent visit Mrs. Elizabeth Moley of Saratoga, California contributed a number of additional items reflecting the cultural heritage of this land. 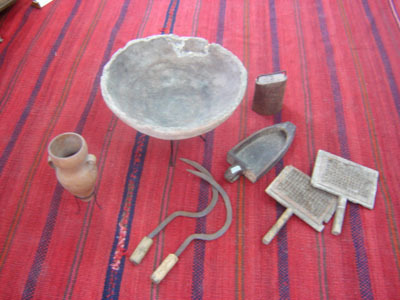 The new items are a cooler made of wood used to cool coffee grains after toasting, two kirdash made of wood and nails used to puff up the hair of goats, two minjal/kaloush made of iron used to reap wheat and barley, a baklouleh made of baked clay, a bell made of iron worn by animals, and a kanun made of clay mixed with hay. In addition, on a previous visit Mrs. Moley donated several traditional dresses of vibrant colors of orange, red, and green worn on the night of a young woman’s wedding. Also, the new Olive Tree Dictionary was included with her generous donation. The Bethlehem University Foundation has provided the funds for the purchase of a new library management system (LibSys). This new information management system contains six integrated modules including: Acquisitions, Cataloging, Serials, Circulation, OPAC (online public access catalog), and Administration. It was designed by Noursoft Software Development in Ramallah and tailored to the Arabic language. 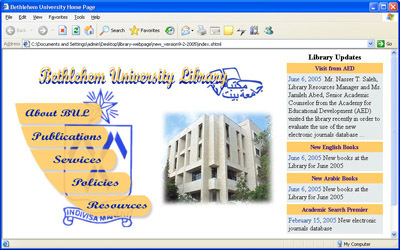 LibSys is presently in use in several libraries in Palestine and Jordan. Installation and staff training are currently in process and the implementation will take place in phases. The publisher Grand Street Press contributed to our library a complete set of Grand Street from 1990 to 2004. The aim of this journal published quarterly has been to introduce gifted international writers and artists to readers in different parts of the world. It was a project of the New York Foundation of the Arts. The collection is located in the Language and Literature section (PN 6010.5 G7). The Prince Claus Fund for Culture and Development, Netherlands provided the funding for the addition of the works of Jabra Ibrahim Jabra, noted 20th century writer from Bethlehem. The special collection of his writings in fiction, poetry, and criticism in both Arabic and English is located in Turathuna. Ms. Hala Marzouka, Head of Arabic Technical Services accompanied by Mr. George Awwad and Ms. Valerie Rock and several faculty members attended the sixth Palestine International Book Fair at El-Bireh Exhibition Hall. This event organized by the Ministry of Culture and UNESCO attempts to promote reading as part of the living culture. The library added 222 books in the Arabic section primarily in Arabic literature, social sciences, education, and humanities. More of the 25,000 books on display will be purchased through local book dealers. Ms. Rana Andonieh assisted Mr. Imad Abu Sa’da, the book binder in the library as part of the short-term job creation grant from the Pontifical Mission. During the two months the two worked together in bounding single issues of the periodicals and journals into volumes. As a result of this project more than 300 volumes have been moved from storage in the basement to the Bound Periodicals on the second floor and are available for students’ research. Mr. George Maria of the AV Center has designed a new and expanded version of the Bethlehem University Library website (library.bethlehem.edu). This site contains all the information about the library including the history of the beginning and the mission. A brief description of services, policies and procedures, and the detailed publications are available. Faculty and students can access the online catalog, the electronic journals databases, and website resources through this site. The cultural heritage items on display in Turathuna are shown. Lists of new books, journals, and audiovisual materials are posted. Ideas are requested on the “Send your comments” page. Visits by school groups have increased recently. During the visit a tour to orient the students to the library is planned. This introduction includes information concerning the different sections, the organizational system, practices and procedures to follow to benefit from the time in the library. The students receive assignments from their schools and are prepared to locate resources in order to complete their research. Recent visits included Talitha Kumi and the Jerusalem School in Beit Jala and the Lutheran School in Beit Sahour. Children from the Pontifical Mission Library have also visited Turathuna to profit from the interactive component of the center. Many researchers doing graduate studies in other universities take advantage of our resources for their research. Individuals in tour groups who make a brief visit to Turathuna are impressed with the collection and displays of cultural heritage in the center. The British Council has made two generous contributions to the library during the year. The first gift presented to us included 44 books on the theme of Jerusalem. These books are valuable resources for students seeking information on the history, religions, politics and government, sociology, and culture of Jerusalem. Most of these books are found in the special collection of Turathuna.